Today I am excited to announce the worldwide launch of the Precision line of Ubuntu-based workstations along with the US launch of the 5th generation of the XPS 13 developer edition. Part of Project Sputnik, these systems began as an open-ended exploratory project to identify what developers wanted in an ideal laptop. With the community’s input, Project Sputnik became an official product and continues to evolve. For more of the Sputnik story, including why this has become the perfect platform for Docker, see below. Before getting into today’s details I would like to thank the entire community for their patience and support as we’ve made our way to launch. All of these XPS 13 developer edition configurations come with the Intel wireless card. The Precision mobile workstation line up is composed of four systems. Joining the Precision 5510, successor to the M3800, we have added the Precision 3510, 7510 and 7710 mobile workstations. This represents our complete Precision mobile workstation portfolio. All of the systems below are fully configurable. Ordering a Precision: To get to the Ubuntu option, click on the “Customize & Buy” button on the system landing page. Select Ubuntu Linux in the Operating System section and away you go! Towers and racks too: In case you didn’t know, we also have a portfolio of fixed Precision workstations — tower and rack — that are available with Ubuntu. There were several minor fixes that were not available in time for launch but have been made available as over the air updates so make sure to run all Ubuntu updates. These fixes pertain to both the XPS 13 and Precisions. With regards to updates, although 16.04LTS will be shipping next month, we don’t have a date for when factory installation will become available. That being said, we do plan to support 16.04 LTS for those who choose to upgrade. How we turned a $40K investment into 10’s of millions of dollars in revenue by focusing on developers. As many of you may know Project Sputnik, as this effort is called, originated with a pitch made to an internal innovation fund four years ago. The fund provided a small pot of money (the $40K mentioned above) and six months to see if the idea of a developer laptop would fly. A couple months after we had been given the green light, on May 7, 2012 we announced the project publically asking the community what they would like to see in a developer laptop. A rough ISO was provided for people to kick the tires and folks were told that if we got enough interest we might be able to turn this project into a product. 10 weeks later, thanks to the amazing interest we received around our beta program, we got the OK to turn project Sputnik into an actual product and in November of 2012 the XPS 13 developer edition became available. As the project has evolved we have continued to solicit and incorporate feedback. Thanks to your support the XPS 13 developer edition has gone from one, to multiple configs. On the higher end, we kept getting requests to add a larger system to the lineup. OS architect Jared Dominguez took note of this and spent a bunch of late nights putting together instructions on how to get Ubuntu running on the Precision M3800. From here interest kept mounting and a year later the Ubuntu-based M3800 became an official product. As of today this original workstation offering has expanded to four systems. would be a “cloud launcher” that would allow developers to create apps within “micro clouds” on their laptops and then deploy said apps to a public or private cloud. Unfortunately this turned out to be a lot more difficult than we had hoped and we put it on hold. As luck would have it however, a couple of years later Docker serendipitously came along. Docker containers provide the functionality of our envisioned cloud launcher, allowing applications created locally to be pushed, as is, to the cloud. Because Docker containers run on Linux, with our Ubuntu-based systems, developers can run the containers natively rather than within a virtualized environment like they would on other platforms. Stay tuned to see how, with your support and input, project Sputnik will continue to evolve. Once again, thanks for all the support and stay tuned for the Canadian and European roll outs! This entry was posted on Thursday, March 10th, 2016 at 5:05 pm and is filed under Uncategorized. You can follow any responses to this entry through the RSS 2.0 feed. You can leave a response, or trackback from your own site. I’m looking forward to put my hands on Precision 5510. Will it be shipped wit 16.04 after April the 21st? Congratulations to the team! Awesome release lineup! Looking forward to having it on my Precision 5510! Is there any bios update required? I’m not sure if I really need a touch screen. Why should I want this?! Great news! This is be my first developer edition laptop and I’ve been looking forward to it. Will the new latitude 7370 also be supported when it arrives? Nice! Looking forward to the i5/matte version. Congratulations to the team! It’s great hardware, I even use the touchscreen now which I never thought I needed. For those who bought the XPS 13 with Windows before the Developer Edition came out, is there a way to get all the officially supported drivers and software as well as the over the air updates? For the XPS 13, the wireless card is different, so wifi drivers are different. Is there any drawbacks to buy a windows edition and then install ubuntu? Are the necessary hardware drivers, tools and utilities available somewhere? The Windows edition doesn’t use an Intel wireless card, but a less Linux-friendly Broadcom based one. P.S. I’m talking about the XPS 13. The Precision 5510 always uses an Intel wireless card. Nice to see that Dell Australia finally got the message ! As they should have a long time ago. For similar specs (similar CPU, same RAM, same SSD, same battery), the Precision 5510 is **much** more expensive than the XPS 15, too bad. 1) different hardware configuration options – like combining i7-6560 with FullHD screen (not sure if I really need QHD and certainly I don’t need the touch option), or possibly including i5-6260 instead of i7 for lower price. I was in bit of a shock when I saw that price of the Dev edition is just 50$ lower than that Windows counterpart and only because of some ‘special’ offer, otherwise they are the same. WTF Dell? So removing Windows and throwing in a Intel WiFi card is apparently worth sticking the same price tag? Bad, bad, policy. I believe I would rather stick with Windows edition and dual-boot it like all previous machines. Now I am somewhat scared to look at Precision offer not to be disappointed yet again. Don’t get me wrong, I am glad that vendors are finally including ‘high-end’ laptops with Ubuntu, or any other Linux for that matter, because there are lot of us who don’t really use Windows on a daily basis or do not want to have it pre-installed on the machine, but there should be more to it than different WiFi card and a 50 bucks discount. I’d like to see an i7/16G/FHD option as well. Xeon/Quadro are not really interesting to me, and I definitely don’t need the QHD screen nor touch. What exactly is Ubuntu 14.04 SP1? Is it 14.04.4 or older? Will project “Sputnik” support a upgrade for the previous XPS13 (2015) too? The official Dell support in Germay doesn’t have information about upgrades. So say say “it isn’t supported to upgrade 14.04LTS to 16.04LTS” (after its release). Vladimir, which country are you based in? I’m in the same boat – I needed to get a computer for work and couldn’t wait, but I chose the Precision 5510 over the XPS 15 and other competitors due to the promise of future Linux support. Thanks to Sputnik for all your work! Great news! But could I please plead for top-end version without touchscreen/QHD for those of us who hate reflective screens? George, it’s great to see how much progress has been made in shipping great Dell products with GNU/Linux. congratulations! Great to see Ubuntu on Precision. But I am unable to configure a 7710 with a 4K screen on Dell stores 😦 . 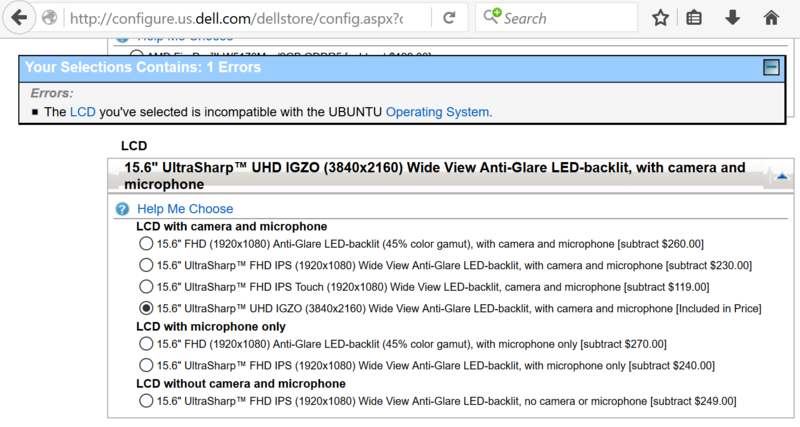 Like @Ryan, the system tells that the 4K LCD is not compatible with Ubuntu. But nobody at Dell (sales people) is able to give any answer to my questions or take any action on this. I think that some action on this is required. Why 4K is not available? Will be available ? When ? Or, can I buy a Windows configuration, throw it, and then install Ubuntu by myself, like I do for years ? firstly, thanks and respect to the whole sputnik team for the effort spreading linux on these nifty devices. -Is there an ETA for the XPS 13 ubuntu series for Europe / Germany? -Will devices like the thunderbolt dock TB15 or similar devices be supported under ubuntu too? Picked up an XPS13 9343 when they were announced last Spring. Been tracking the updates from you and Dell’s support page for the keyboard jump issue. A07 has not fixed the problem and the last update was in November. Is there anyone you recommend on the Dell Pro Support team that can help straighten this out? Thanks in advance! Big fan of the design of these notebooks and your work with Ubuntu. This sounds like the laptops would run with a non-patched standard Ubuntu. True or wishful thinking? I can’t buy the Developer Edition although I’d like to. If I buy a regular New XPS 13 (non Developer Edition) and then I install it the Ubuntu developer Edition (like in this link https://www.dell.com/support/article/us/en/04/SLN297060/en/) will it be exactely the same? or the Developer Edition has any different software to make it more compatible with Ubuntu? I bought a Precision 5510 Ubuntu edition, have waited for two weeks. Today, after an upgrade from clean (and updated) 14:04 to 16:04 I can’t log into Unity since it’s constantly crashing. This is soooo frustrating 😦 ! It would be really cool, if you would provide more detailed upgrade instructions. Please, please, please. I purchased the new i5 Dell XPS 13 Developer Edition and it has been a disaster. Suspend/resume doesn’t work out of the box (among other things). I’m working with tech support right now but will probably ask for a refund at this point and just go with System76 or another vendor even though their hardware isn’t as nice as Dell. It’s been a very big disappointment. If Developer Edition comes with Ubuntu pre-installed, I expect suspend/resume to work out of the box. Im sorry to hear about your suspend/resume issues. Let me email you and loop in the support rep on the Sputnik team. All my issues have been resolved 🙂 For the record: just install 16.04 LTS when you get your new XPS13. 16.04 has the 4.4 kernel with native Skylake support. Everything works flawlessly with it and without any additional configuration. Thanks to Barton and the Sputnik team! What’s the verdict on video out on the XPS 13 9350 with Linux? I’m finding tons of mixed results on that Type-C port. This is the only thing stopping me from getting one is that uncertainty (as I really need to be able to do HDMI/VGA out, and want that gigabit LAN). Will the update to 16.04 LTS also be possible for owner of the 2015er model (9343) of the XPS13? It would be very interesting to get an answer here. Are there any experiences with an “unofficial” update? Thanks. I was looking at the possibility of ordering the Developer Edition today and a support supervisor told me Dell was End-of-Life-ing the XPS 13 Developer Edition and I couldn’t order it. Is that right? I’m in the U.S. I was talking with a supervisor (who’s name I can send you if needed) who called me after a small business support chat when I was asking about a XPS discount code. He has since send me a quote with linux listed after I made it clear I wasn’t interested in a windows version. But it did make me start to feel uneasy about future support. I’m glad to hear the Developer Edition isn’t going away any time soon. I ordered the top XPS 13 model begin of August. Immediately after sending the BitCoin, I received an eMail from dell, that I should receive an official order confirmation after two days the least. Twenty days later, I have still not received any further communication from Dell. As the order is not registered in the system, I am unable to contact support. So essentially my money is gone and I don’t even know if I will receive anything in return. Somebody on the forum indicated that the order might have been cancelled because it was intended for export. But even if that is the case, keeping the money without notifying the customer is about the worst thing a company could do. @ulrichard, Im really sorry for your experience. So that i can look into it, what country are you in? I’m in Switzerland, but since BitCoin is still not accepted in Switzerland, I ordered in the US store to the address of a friend. It has been almost a month now since I placed the order, and since I received the last communication from Dell.